Let’s talk hash. Not trash hash ordered from sticky laminated menus found in diners off strung-together highways. There’s certainly the exception, but that hash often consists of whatever leftover diced meat needs using up (think corned and roast beef) combined with diced potatoes (could have been frozen) and lots of grease. Oh yes, lots of grease. No complaints. That’s the point of a greasy spoon, right? Just sayin’. I’m talking about a certain breed of hash found at a certain breed of diner; diners that hold an iconic place in a city or small-town’s landscape. Some are easy to spot. First you note the decor, often kitsched-out vintage Americana. Think lots of chrome, splashes of neon, comfy banquette vinyl seating, maybe a jukebox, and generally an oversized clock on the wall. The hash you’ll find in these venues is different, the Fleetwood Diner’s hash being a good example. This Ann Arbor landmark, which constructed a second outpost in Lansing a couple of years ago, features a Hippie Hash, which bears no resemblance to the aforementioned hash. Their vegetarian signature hash is composed of a layer of homemade hash browns, topped with loads of veggies and feta cheese. 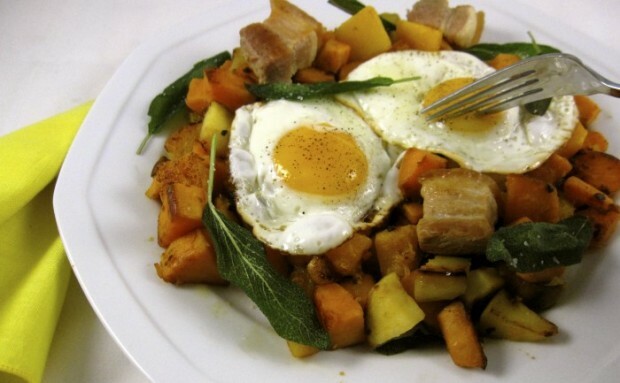 San Francisco’s a city know for its fabulous and funky diners, and the following recipe was inspired by Citizen’s Band Sweet Potato & Pork Belly Hash. Their dish is somewhat different than the one penned below, including other varietals of potatoes and brussels sprouts. I added apples and fried sage leaves to mine. I’d be willing to bet there pork belly came from a tony breed of hog, humanely raised on a tree-hugging, free-foraging farm. Funny how food trends are always changing. One month a friend’s telling me about their favorite low-fat recipes, the next extolling the virtues of a pork belly dish they had at Ann Arbor’s Grange restaurant. Never tried pork belly; unsure if it’s something you (or your cardiologist) would appreciate? If you’re ever at Marks Carts, one of the vendors at San Street would be happy to give you a sample. Diners with the retro bells and whistles are atmospheric fun, but not essential to guaranteeing a place in a town’s affections. Some beloved diners are less noticeable, windows shuttered and curtained, tucked into a corner on a main drag. Think Bell’s Diner on Stadium, another Ann Arbor favorite. For me, the bests diners are cheerful, comfy settings where generous portions using fresh ingredients are the rule, all served at a reasonable price. Those diners that indulge children with crayons receive an extra star. Many of these diners serve breakfast around the clock, especially appreciated after a night of carousing, and are venues where it’s acceptable, even protocol, to read your paper or pad while forking a better breed of hash into your mouth. Heat 1 tablespoon oil in a heavy-bottomed skillet or Dutch oven to high heat; sear pork belly on all sides. Add chicken stock and bring to a boil. Reduce to low heat and braise, covered, until pork belly is tender. Drain and set aside. 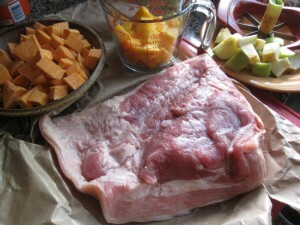 While pork is simmering, place squash and sweet potatoes in a medium-sized pot. Cover with salted water and boil until just tender, 4-5 minutes, careful not to overcook as it will be later sautéed. Drain and reserve. In a large fry pan, heat 2 tablespoons oil over high heat. Fry sage leaves until crispy, 30-45 seconds, then remove from oil and drain on paper towels; lightly season with kosher salt. Reserve. Reduce heat to medium-low and stir in onions and sauté 5 minutes. Stir in garlic, apple, reserved squash and sweet potatoes and cook until apple is tender, about 5 additional minutes. Stir in butter and season with kosher salt and freshly ground pepper. Heat another skillet to medium heat, add remaining tablespoon oil; and crack eggs into pan and cook until desired level of doneness, seasoning with kosher salt and freshly ground pepper. To serve, divide and spoon sweet potato mixture onto 2 large plates, drizzle with molasses, and top with fried eggs, fried sage leaves and pork belly. Serve.